Bettering the Obsidian 800D, developed three years ago, Corsair has unveiled the improved version of its earlier PC case, in the form of Corsair 900D, at CES 2013 in Las Vegas. 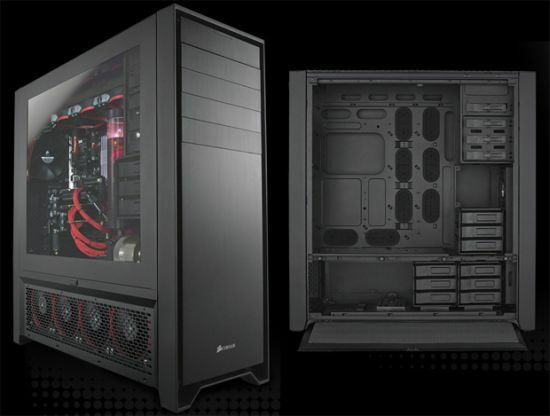 Hailed as “Godzilla,” the huge PC case features the H100i, with fans on either side, on the top. Integrating the I/O panel with two SuperSpeed USB 3.0 and four USB 2.0 ports, four 5.25 drive bays, three 120mm fans and a triple 120mm radiator in the front, the Obsidian 900D offers adequate space for nine hard drives or SSD’s and additional six (less than 5.25″) drives at the bottom. Running on the Corsair AX 1200i power unit, the 900D can simultaneously handle two power supplies with ease, plus the user can install an optional 4x120mm radiator. There is enough space to install up to 15 fans to keep the system cool. Improving on the limited expansion slots, the new Corsair PC case offers 10 expansion slots to ensure a smooth functioning with heavy duty motherboards like eATX, XL-ATX and HPTX. Though there is no word on the cost of the case, but the Obsidian 900D will reach the market by next month.